The weekend and all the races are over. I can never believe how quickly the race weekends fly by. The interview at WICZ Binghamton went extremely well, better than I would’ve ever imagined. The weekend was definitely interesting to say the least. Through sun, rain, wind, and snow we endured a lot. On Saturday I didn’t qualify nearly as well as I was hoping to. It was raining on and off all day, but it stopped raining and was sunny before the race. It wasn’t supposed to rain until an hour after the race so the entire field went out on our slicks. (That’s what we call our dry tires.) In the race I was doing very well, making passes, I went from 15th to 11th place. A few laps in, and we had a full course caution. During the caution it started downpouring. My team and I made the decision to switch to rain tires, a decision that only one other driver made. While we were switching tires the race went green again and about half of the cars crashed in the first corner. That was it. The race was called for safety purposes. The official results put me in 9th place, which I was pleased with. On Sunday I qualified 4 positions better than I did the day before! I was extremely ready for the race. I was doing well and making passes on the first lap. On the second lap I went into turn one about to make 2 passes into the corner and the second car I was going to pass spun out right in front of me. I did everything I could to avoid the car, I avoided it initially, but he started rolling backwards, and rolled right into me. The damage wasn’t too bad, but it ended my race after only completing one lap. It was a terrible way to end the weekend, but as a whole I am happy with the racing this weekend. I got a lot of experience that will help me for future races, and after all, this is only my second race weekend in this kind of car. I absolutely cannot wait to get in the car again! 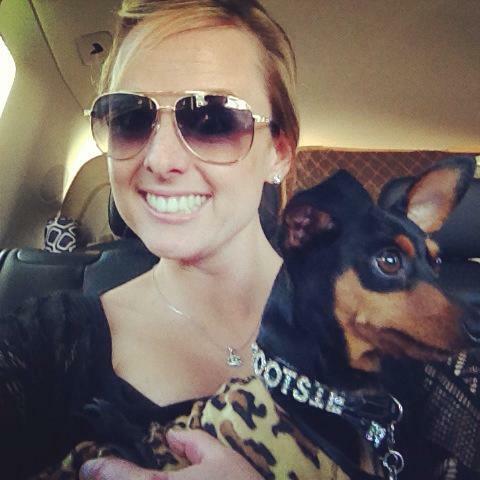 We want to encourage everyone to show their support for TeamAWARE by wishing Jenna a safe and successful race today. You can post your good luck messages on the CPC’s Facebook or Twitter page or you can send them directly to Jenna Grillo on Facebook and Twitter. Let’s all show our support for our favorite spokesperson. The CPC is happy to announce that we have joined the National Fibromyalgia Association to form Jenna Grillo’s TeamAWARE. 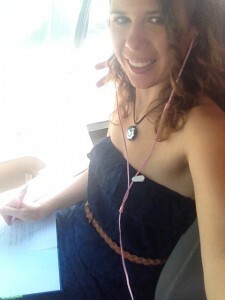 Jenna is a ninteen year old woman who has suffered with pain caused by fibromyalgia since she was nine years old. 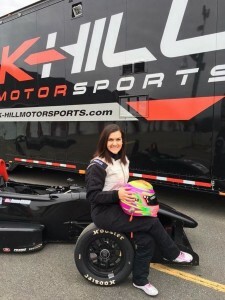 She is steadily moving up in her racing career and wants to use her platform to help bring awareness to the cause of FM and chronic pain. Qualifying for the Race today, and interview too. Today was our practice day. I think that I am one of the only people who haven’t been to this track before. If that is correct, I’m at a bit of a disadvantage! This track is much different than the other tracks that I’ve been on in the F2000. This track is extremely fast, and you have to carry a lot of speed into pretty much every corner which is different than I’m used to. It’s a great way for me to learn how much I can push this car. I think what I learn here will be very useful at other tracks down the road! We only had two practice sessions today so I’m a little bit nervous. The next time I’ll be on the track is tomorrow morning for qualifying and I’m still a little off pace. I’m not too sore, which is good because I am on my way to a local news station WICZ in Binghamton, NY to do my first ever interview! I’m really excited about this, but it’s a little weird to think that I’m going to be on TV. I guess I should get used to this though! Stay posted for the videos of the interview! I just arrived at my hotel in New York. I walked around the 3.37 mile long course with my driver coach and some of the other drivers. We talked about the correct lines and braking points. I already knew a lot about the track, but this way I’m able to actually get on the track and see it in person! They repaved the entire track earlier this year, so some things about the track were a bit different than the video I have been watching. I am really excited to get on this historic track! I have two practice sessions tomorrow (Friday) qualifying and a race on Saturday, and also qualifying and another race on Sunday! I can’t wait to actually get back in the car and get some laps in! What does it mean to have fibromyalgia? 5 days till race. I am extremely happy that I am starting to get a lot of attention as my racing career continues to progress. I am using that attention to bring awareness to chronic pain and fibromyalgia. The NFA was founded in 1997, only a year after I was born. They have accomplished SO much in the last 19 years, but there are still a lot of things that we’re trying to accomplish in the fibromyalgia community. One of the things that I hate most about fibromyalgia is the negative stigma surrounding it. It is absolutely astonishing how many times I have heard that people with fibromyalgia are making everything up. We’re making excuses to be lazy, and that the pain is all in our head, which is absolutely not true. It’s clear to me that people just don’t understand what it means to have fibromyalgia, so I am here to teach people what it means. We are not lazy; we are not making it up. Every single part of our day is a battle. We fight to get out of bed every morning, we have to fight to leave the house and socialize with other people because the pain can be so debilitating at times. We have good days, and we have bad days, although to us sometimes it seems impossible to tell the two apart because even on the good days, we still feel pain. We feel so weak, but we don’t realize that we are much stronger than we may ever know. We are warriors, and we are more than the pain caused by fibromyalgia. Stay hopeful and stay strong my fellow Fibro Fighters because hope is on the way at 150 miles per hour! Keep checking back leading up to the Awareness day race to hear more from me! I don’t want my pain to get in the way of my dreams, 7 days and counting. I’m getting ridiculously excited for the race at Watkins Glen in New York this weekend! At this point in my pre-race routines I have been making sure to get at least 10 hours of sleep every night. Here is a picture of me with my cat Boo. I have also started taking it easy in the gym, making sure that I stay active, but also making sure that I don’t push myself to the point that my body needs to recover. I do this to give my body a little bit of a break before the race weekend. I am taking hot baths using Epsom salt and essential oils (my favorites are a mixture of lavender and eucalyptus) to soak and relax my muscles, and it’s a great way to relax my mind before bed each night! I am continuing to study the track map, notes and videos from my driver coach Skylar. I do this to get a clear picture so I can get up to speed as quickly as possible, especially since I haven’t been to Watkins Glen before! Be sure to keep watching for my blog entries, and connect with me on Facebook as we lead up to the race weekend!! Preparing to race for Awareness Day, 10 days out. I am so excited that my racing at Watkins Glen is directly following Fibromyalgia Awareness day 2016! What an amazing time for Jenna Grillo TeamAWARE to partner with the NFA and CPC. This year’s awareness day is going to be HUGE! A lot of things are going on behind the scenes right now. We are working with the media in New York and thanks to the help of the NFA and the CPC, it is all coming together! I am also doing a lot to prepare for the race! I have been studying track maps as well as detailed notes about driving lines, braking points, and tips about the track. My driver coach also sends me on board videos of the track to study. The team that I am with is K-Hill Motorsports and they have such amazing people working with them to help me be successful every race. With my fibromyalgia I have to get my body prepared for the race as well. I have been making sure to keep up with my workout regimen to keep my muscles strong and ready for the races. I also make sure to get TONS of rest, drink a lot of water, and eat very clean and healthy meals. I recommend all of those things for anyone who struggles with chronic pain. I really advise people with chronic pain to stay active, pools are an amazing way to get started, especially for those who have painful joints! I am so excited to celebrate Fibromyalgia Awareness Day 2016 with each and every one of you!!! Keep watching for my blog posts leading up to the race! It’s hard to believe it was 20 years ago that I first heard the word “fibromyalgia”! Little did I know then that during the next 20 years, I would spend my life inventing and implementing ways to help educate and support people with this painful disorder. It’s bad enough to live in constant pain, but it is unimaginable to be told that its imagined or just the result of stress or something you should rise above! No, fibromyalgia is real and I wanted everyone in the world to know that my pain deserved to be recognized. I needed to find ways to help decrease the pain of millions of people living with fibromyalgia! With the establishment of the National Fibromyalgia Association in 1997, the FM community was given a platform upon which to create a voice. One of the first major programs the NFA developed was National Fibromyalgia Awareness Day, celebrated on May 12th every year. The FM community immediately rallied around the idea and embraced the opportunity to share the message that awareness and acceptance of FM would lead to a better understanding and improved treatments of the illness. Every year since 1998, the National Fibromyalgia Association has helped to unite the community to share stories and talk about the communities’ needs through media outreach, local and legislative Proclamations, letter writing campaigns, special awareness events like the “Walk-of-Fame” and “All Wheels for Fibromyalgia- Race Across America”, the creation of public service announcements, the development of Fibromyalgia AWARE magazine, the “Pledge to Care” program, “Ask Lynne” (a video education program), and more! It is because of these efforts, the fibromyalgia community became motivated to get up out of bed and let it be known that we are sick, we are suffering, but we are willing to work hard in order to get our lives back! Now, 20 years later, almost everyone knows that fibromyalgia is a chronic pain illness that is life altering. And yes this accomplishment is worth celebrating! But, there is still much more that needs to be done. Our efforts must continue because people with FM and other kinds of chronic pain are still suffering. We need to make sure that progress is being made every day to find options, new solutions and ways that people in pain will receive the support and assistance that we so truly deserve! Today, the Community Pain Center joins in the effort to STOP the pain of over 100 million people in the US who live with pain on a daily basis. As we launch our new collaborative awareness campaign, “Jenna Grillo’s TeamAWARE, Racing to Support People with Pain”, I believe that we are entering the next phase of “pain awareness”. 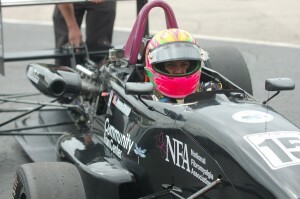 Jenna’s dream is to one day race in the Indy 500, despite the fact she has fibromyalgia. But Jenna doesn’t just want to become a competitive race car driver. She wants to be a race car driver with a cause! When Jenna feels the 2 ½ G’s on her body as she takes a curve going over 140 miles an hour, she knows that she isn’t only moving closer to the Indy 500, but she is also helping people in pain. As a patient advocate and spokesperson for the pain community, Jenna hopes to inspire others to follow their dreams, no matter how big or small, and to know that there are ways to improve your health, decrease you pain and get your life back! As a fellow chronic pain patient, I am passionate about helping others in pain and sharing helpful tips whenever possible. Ironically enough, I’ve also worked in the pain medicine field alongside numerous high profile pain management physicians for the last 5 years—so I’m very familiar with not only the standard treatments and therapies for pain, but many tips and tricks that only come with trial and error as well. Whenever I get the chance to blog, I hope to share lots of helpful tidbits that will hopefully be of value to the pain community. So here’s a great one to start with: my top five recommendations for helping you get some zzzzs. Invest in the right mattress for you. People often underestimate this factor—but this is VITAL. A firmer mattress is better for back pain, because it helps support proper alignment of the spine. I once bought a Sealy brand firm mattress that has proven to be the best I’ve ever had, but I must say, Sleep Number mattresses might be worth looking into, since my husband and I recently bought one and we both like to adjust our sides to our own settings. It is crucial to make sure your pillow is the right height. Your shoulders and neck need to be supported and aligned so that your spine is straight. Chiropractors and osteopathic doctors will often recommend a cervical contour pillow, like this one, that you can find at Target, Walmart, etc. Try using a body pillow. If you’re a side sleeper, something like this might help your comfort level while sleeping. Tucking the pillow between the knees can reduce back pain by relieving pressure from the lower back and wrapping your arms around it takes pressure off your shoulders. If you’re a back sleeper, try a wedge pillow under your knees, or use a regular pillow to reduce the gap between your lower back and the bed. All of these tips are aimed at aligning your spine while you sleep to alleviate pain while trying to fall asleep and the stiffness you might be feeling in the morning. Check with your doctor about pain-relieving creams, patches or devices. I like Lidocaine ointment, Topricin Pain Relief and Healing Cream or an anti-inflammatory pain patch. For tight muscles, ThermaCare heat wraps help me quite a bit, and they’re available at pharmacies and grocery stores everywhere. Sometimes I apply one before I go to bed or if I wake up with pain in the night. Also, you might ask your doctor about a portable TENS unit, which is an electrical nerve stimulation device to reduce pain. Before bed, take a hot shower, bath or dip in the hot tub. Not only does this help ease tension and relax muscles, but it can promote sleepiness as well. Infusing a hot bath with aromatherapy oils and/or Epsom salt can decrease inflammation and release the stress of the day. Epsom salt can be purchased inexpensively at your local pharmacy or grocery store. When we read books written from the 1980s, the authors were visionaries when describing technology that hadn’t been invented yet. But now we can turn around and see that the technology that was mere fiction back then is coming to life now. In Terminator robots having artificial intelligence was once fantasy and, quite frankly, a horror for many people. The idea that a robot could think, learn and act on its own is actually coming to life. Japan has created robots to act as home nurses to help caregivers, making lifting and heavy duty tasks easier. IBM has recently created a computer that learns called Watson, which is being trained by Memorial Sloan Kettering (MSK) Cancer Center and “…suggests tailored treatment options—along with supporting evidence—to clinicians by extracting key information from each patient’s health record and cross-referencing that with MSK expertise, curated texts and case histories” (IBM: Watson for Oncology). They call him Dr. Watson due to the fact that he can answer questions about leukemia now. Back to the Future has flying cars and, if you are a Disney fan, Zeon (along with many others) has self-driving cars. Both are being created in our lifetime. Companies are in a fight to the finish line to be the first. Now, would I trust myself to fly a car? No, I wouldn’t even trust my mom and dad in one of those! Sorry, I love you, but no. However, a self-driving car opens the doors to so many people who have been isolated due to their illness or condition. People who either couldn’t drive due to a diagnosis or no longer could drive because something happened (car accident, amputation, etc.) now could have the world opened up to them. A computerized car offers those who couldn’t get a job due to transportation issues the chance to have a job, which leads to income, which then leads to money and better care. Technology is changing. The imagination of those over 20 years ago is finally being realized. If it’s dreamed today, what could happen tomorrow? Qualifying for the Race Today, and Interviews too.